From Omniscope 2.8 Beta, you can now import data from ESRI Shapefiles (.shp) and Google Earth (.kml) files. These files typically contain geographic data, such as points, polygons and polylines, with additional metadata. Omniscope allows you to import this data as a flat table of fields and records, take advantage of the powerful ETL DataManager merging and transforming operations, and/or open in Omniscope for exploring and analysing in the Map and other views. When imported into Omniscope, the data is treated no differently to non-geo data. You can filter and aggregate, for example. Typically two fields will contain the lat/lon coordinates of each point or vertex, and other fields might exist for metadata or path ID purposes. Please see the demo file. I wanted to get a clarification on the shapefiles allowed, is there an issue where the shapefiles using OSGB coordinates do not work as overlays? I'm having trouble getting any to show up the way they do in the examples. Hi Daniel - Omniscope's Map View only supports plotting coordinates in the WGS84 Geographic Coordinate System. 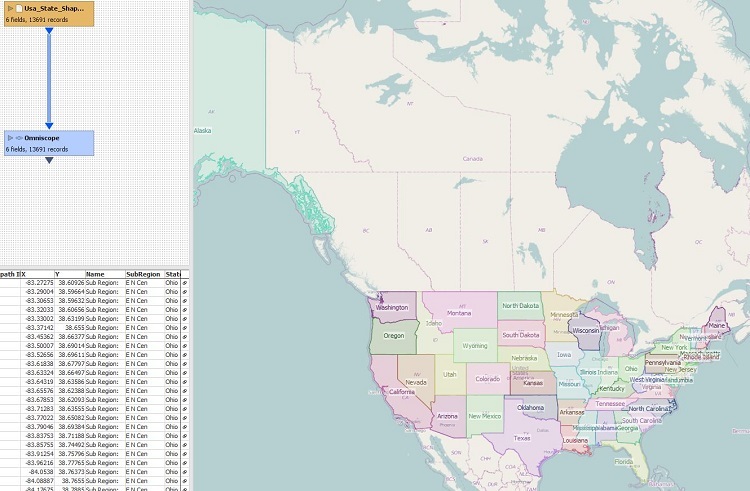 However, Omniscope can load shapefiles in any Geographic or Projected Coordinate System (including OSGB). In 2.9 we are intending on building a connector for various Esri ArcServer services. One of these will likely be a coordinate conversion service which will open up the possibility of converting a wider variety of coordinate systems into WGS84. I did got them to load that way but I really hoping to get the overlay to do it so I could have shaded areas instead of just the outlines. Is there a way I'm overlooking to connect the points and shade the individual shapes using the existing map view options? In 2.8, if you want to use this data as an overlay then you will need to save it out to a file with the WGS84 coordinates included. The reason for this is that the Map View currently only supports plotting overlay data which is already formatted correctly. It cannot carry out additional transformations, e.g. coordinate conversion like the DataManager. You can save out in any of the supported file types, e.g. CSV, IOK etc and a Map View will be able to build the overlay layer. When importing the data back in to a Map View you will be prompted to choose the data type (in your case 'Area') and the Overlay ID, Overlay Sub-path ID, Longitude & Latitude columns. The field options should already be populated but just check that they are correct. If run into any problems with this then we can do a quick screen share. We are in the process of creating more demo's and tutorials on how to use the this functionality. Got it working, will Visokio consider making overlays a possible look up resource like with the postcode look up files? 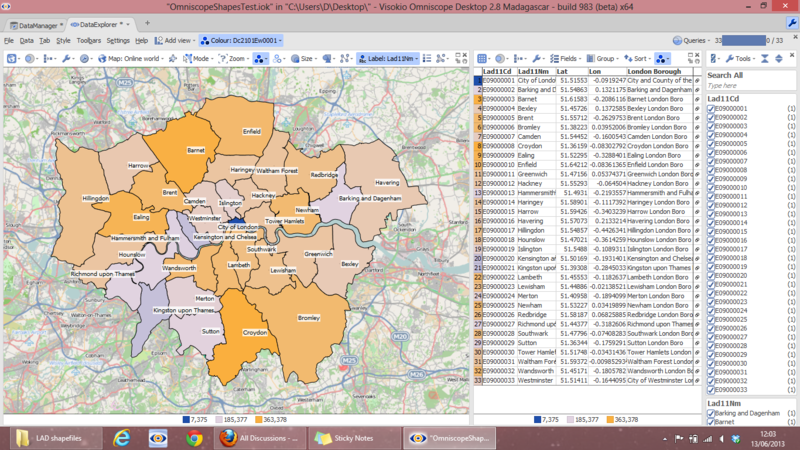 It took a bit of work to process down the shapefiles to csv. We haven't yet decided what will be available.